Nancy has an Associate of Arts degree from Glendale College – 1949; a BA from Long Beach State College – 1952, with teaching credential; and an MA from San Diego State College – 1977, Alternative Ed. She had three kids beginning 1953, and began her career working with children. She directed a family co-op nursery school for five years, using children’s folk music as a main component of her work. Somewhere in the mix, Nancy taught High School Art for 11 years at Orange Glen High School in San Diego County, then moved to Berkeley, California where she taught music for three years with the California Arts Council. 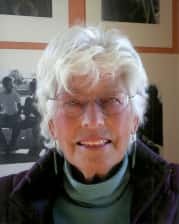 During the summers for nearly 40 years, she taught music at Cazadero Music Camp, and music and art at Washoe Pines Environmental Camp in Nevada. Nancy started taking photography classes with Henry Gilpin in Monterey in 2003, followed by a class in lensless photography with Martha Casanave. This method took her by storm, and has been her passion ever since. She was a member of the lmagemakers in Monterey for six years, enjoying the company of a wonderful group of photographers. AI Weber has been her most important mentor, lending his advice, help, and wisdom on many excursions, the Mission project, Shooting the West, and his famous Rendezvous. Exhibits have included galleries in Monterey, Carmel, Salinas, Minden, with two recent exhibits — one in Elko, and the other in Virginia City. Nancy now has her first darkroom, which makes thework delightful. She has nine large tin can cameras, and two pin Holgas (made in Martha’s class), and somewhat resembles a bag lady when out photographing. 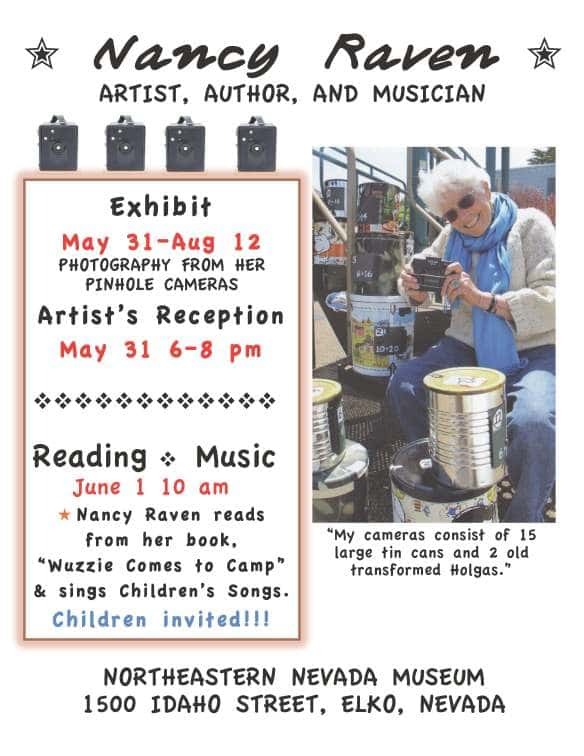 Nancy first learned about pinhole photography in 2005 when she took a class from a pinhole master, Martha Casanave, who teaches at Monterey Peninsula College. The medium was fascinating to her, and she loved the quality of the photographs, with their dreamy, noir look. The photos seen here were all taken after her recent move to the Minden, Nevada area. They were taken with a large tin can camera which uses film. There are no lenses on either camera. The light coming into the camera from only a pinprick makes the picture. It’s wonderful fun and extremely exciting when you get a good print.